13.1 miles is no easy feat. Check out these 3 half marathon workouts guaranteed to improve your strength and endurance, and to help you crush your next half! Half marathon workouts require a blend of endurance, speed, and stamina, and mile repeats are a perfect way to build all three. The first week of your mile repeat workout is going to be a 3 x 1 mile repeat, resting 2 minutes in between, and aiming to maintain a half marathon to a 10k pace. Exceeding your target half marathon speed is what’s really going to build that strength and stamina! The next week, you’ll bump that up to 4 x 1 mile repeats, keeping that 2-minute rest. Increase the workout by 1-mile repetition each week until you get to 6 x 1 mile repeats, always resting 2 minutes in between. Your goal: consistency! Try to keep a similar pace across all of your mile repeats each week. Coach Nate recommends approaching that first mile or two with caution, and then working hard to build your speed throughout the workout! If any of the progressions are too much, no worries! Just repeat the previous week’s count, pushing yourself to be more consistent with your mile times. Adding the element of a negative split to your long run is a tough but super effective way to crush it on race day! We’ve got two versions of this half marathon workout based on your experience. A major focus for newer runners on a long run is simply building up that mileage, so keep things slow and steady for the majority of your long run. Focus on staying tall and relaxed while you work your way up to those longer distances! 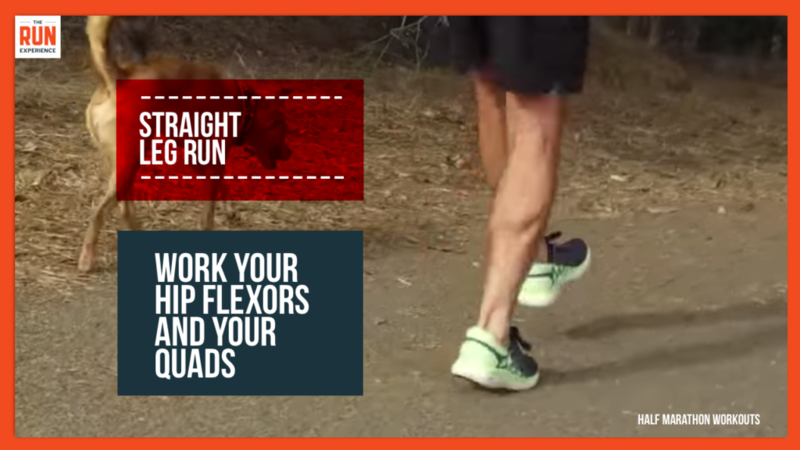 The difference in this workout is that you’re going to save a little purpose for the end of your workout, and run the last 20% of your distance at race pace. If you’re not sure what your race pace is, guess! Try what you think you’re capable of, and adjust as needed from there. This will help train your patience at the beginning of the run, and then that physical and mental strength you need to push through to the end! Because the mileage itself isn’t all that new to advanced runners, we’re going to focus on stamina and race pace here! For these long runs, you still want to stay steady and conversational through the beginning of the run, always focusing on technique. But for you guys, we’re going to increase the amount of time run at race pace. So, for week 1, aim to run the last 20% of your run at race pace. Each week, increase that percentage by 5% – so Week 2 it will be 25%, Week 3 will be 30%, and on Week 4 you will run the last 35% of your long run at race pace. Those percentages aren’t set in stone but push yourself so that by Week 4 you’re running a good amount of your run at race pace. It won’t be easy, but you’ll be glad you did it come race day! Drill Day is so vital because it allows us to zone in on mechanics so that we not only finish our race when we want, but we look and feel good doing it! You’ll walk up high on your toes in one direction for about 20 meters and then walk on your heels with your toes up in the air on the way back. 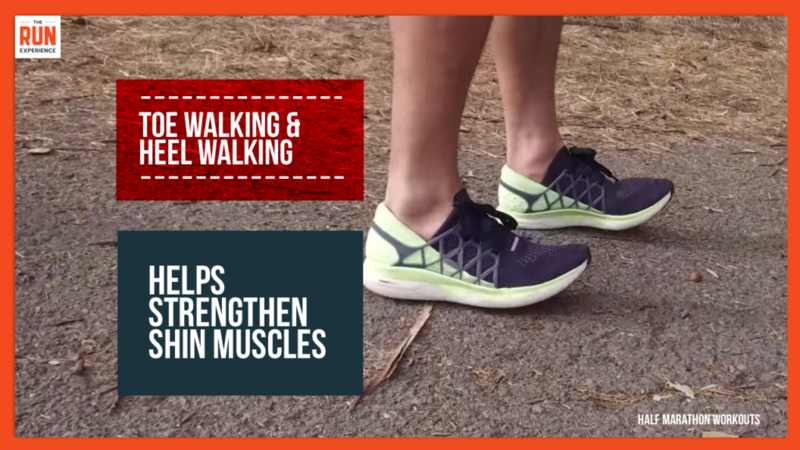 These walks are all about lower leg strength, so focus on your calves and ankles on the way there, and on the muscles around your shin on the way back! This one may look a little silly, but it’s extremely effective for quad and hip flexor strength! All you do here is run with straight legs and flexed feet for 20 meters, and jog back nice and easy, and repeat that 3 times. 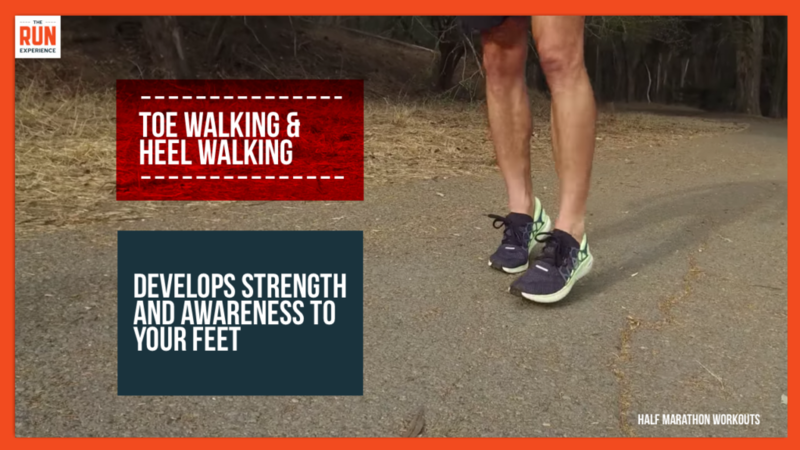 You should be running at a higher cadence here, working with quick feet and straight legs! For this drill, we’re going to put into practice those mechanics we just worked on with 5 x 100 meter easy sprints. The time goal for each repetition is between 15 and 20 seconds, so you adjust your distance accordingly! For each effort, start slowly and work to accelerate throughout. Take a nice easy jog back and then repeat, aiming to free up your stride a bit more each time. Looking for more half marathon training tips? Whether it’s your first or your 10th half, this free guide has all you need to know before your next race!